I've felt God's presence in my life before. 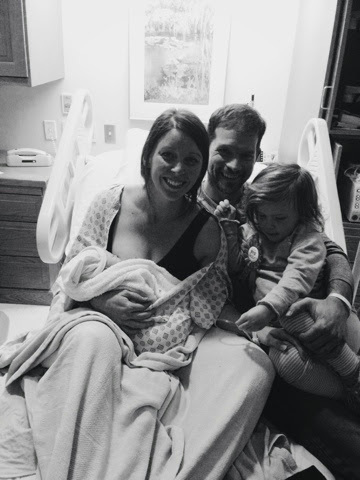 But nothing like November 17, 2014-- the day we welcomed baby Kate into our lives. A little background before I share this story. 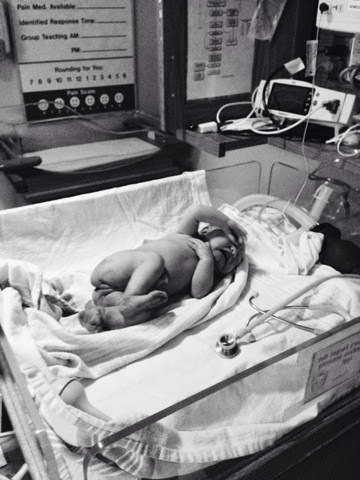 Molly was born at 36 weeks, 2 days weighing in at 7 pounds and perfectly healthy. Thus, I had myself convinced this baby would be just as early, maybe earlier. The joke was on me. I spent the weeks from 36 through 38 wondering if this baby would ever come. And I feel so silly writing this, because I know women deliver weeks past their due date, but I felt some major impatience those last days. And I did a lot of questioning. How big is this baby going to be? 8 lbs? 9 lbs?! Turns out, at my 38 week appointment, I was barely dilated, and my OB told me I was "not inducible". 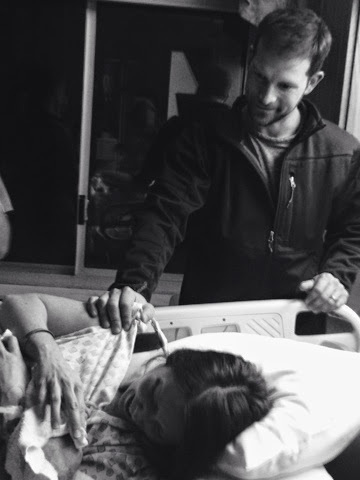 Though a truly natural labor and delivery is all I had prayed for, I felt a lot of pressure and anxiety after hearing those words. 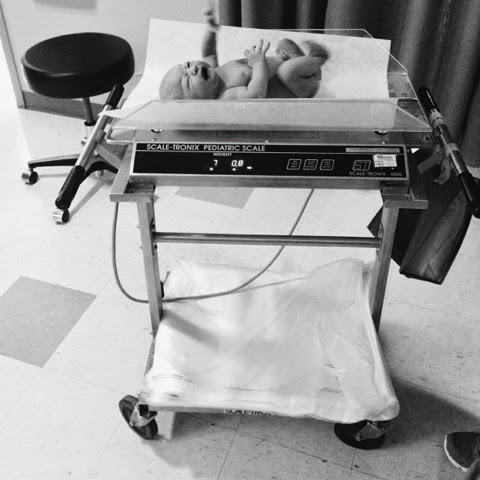 I was terrified of induction, but I think the thought of a really big baby was worse. To add some insult, I had some really good Braxton Hicks contractions for the weeks prior, some would last most of the day. There were a lot of days I thought labor was starting. But it wasn't. So on Monday, 11/17/14, when I woke up from Braxton Hicks contractions around 6am, I really thought nothing of them. I decided to go into work for at least half of the day, but my office manager said it wasn't too busy, and since we had really cold temperatures, it wasn't worth my trip in. So Molly and I hung out at home most of the day, with a trip to the library around noon. I noticed, while playing farm in the children's library, that the contractions I had been ignoring were kind of regular, and actually a little more painful that my previous ones. Still, I wasn't competely convinced. I did time a few after we got home, around 2pm-- they were 10-11 minutes apart. Still not sure if this was real, I caught up on some housework. Around 3pm I had to stop the vacuum to breathe through a contraction. I figured it was time to tell Jesse. This is where I went wrong. He's a farmer, and naturally, he's late for everything. I told him to get home "within the hour". So, as you can imagine, when he pulled in at 5:15, I was a nervous wreck. By then, my contractions were 4 minutes apart, I was having really consistent spotting, and had developed a lot more pelvic pressure. Shoot. My Mom took Molly around 5:30, after gasping "you better get going, your belly is so low!" I had a few good contractions in the car (the worst place to labor, by the way), just enough to get Jesse driving a bit faster. We arrived at the hospital just before 6pm, and I was greeted by one of my favorite nurses, seriously a Godsend. And I was only 4cm. 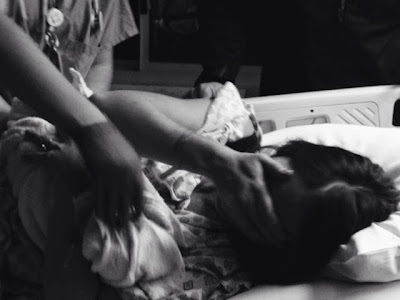 I almost got discouraged, but after walking from OB triage to the delivery suite, my contractions jumped to every 2-3 minutes, and I knew something was changing. Enter another of my favorite OB nurses, and another and another. I was surrounded by the most empowering women, all OB nurses, all completely on board with my non-medicated delivery plan. They positioned me through contractions (and I ended up laboring on my hands and knees- just as I did with Molly), encouraged me during the breaks, and taught Jesse some counter pressure points (on my hips/pelvis) that seriously made contractions so much more bearable. This is where I start to tear up, just thinking through the people God sent that night. Because my OB stopped in around check-in to wish me luck (though he wasn't on call), and I briefly met the on-call OB. But as I progressed, things fell into place even more. I was checked around 6:30, 6cm, bulging bag of fluids. It wasn't 3 more contractions when the on-call OB stopped by to say that he was doing a c-section and would see me after. Immediately after, probably around 7:30 pm, my water broke during a contraction. A contraction or so later, I felt pressure, and I was 10cm. A local midwife happened to be on the unit, and walked in to quickly introduce herself, and guide me into pushing. Seriously, how perfect. 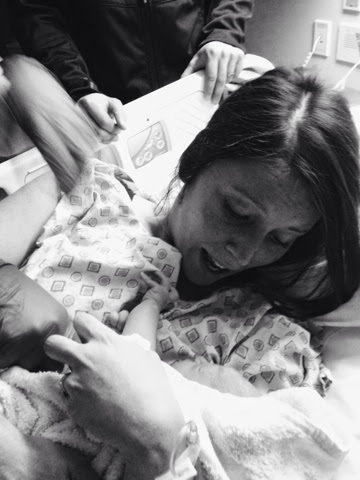 I wanted the most natural delivery possible, but I feared induction, meds, episiotomy. I'm telling you, I think I heard one of the nurses say "the stars aligned" when the midwife came in the room, and I couldn't agree more. She positioned me on my side and sat on the side of the bed (which is in complete contradiction to the typical stirrups/push on your back only medical pose allowed in a hospital). The women in the room, along with my husband (whose poor hand I squeezed really hard), coached me through what felt like a few seconds, though I'm sure it was minutes, of pushing. The best example of support, is in my last push. 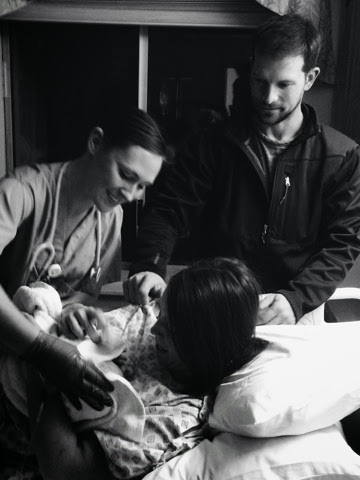 I was having a really painful contraction at the time the baby was crowning. I was completely engulfed in pain, and I started to panic. I heard the sweetest voice reassure me and say "Lisa, push into that pain", she just knew. And that was it, one last push. 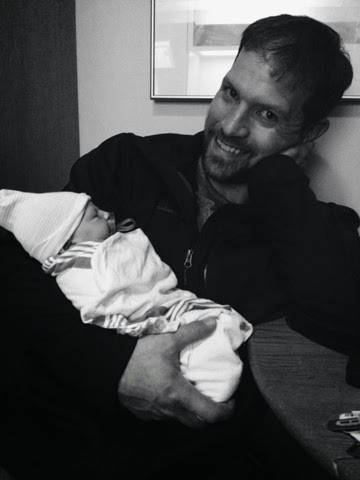 And just less than two hours after we walked into the hospital, our sweet midwife announced "it's a girl" though the first screams of our new baby. 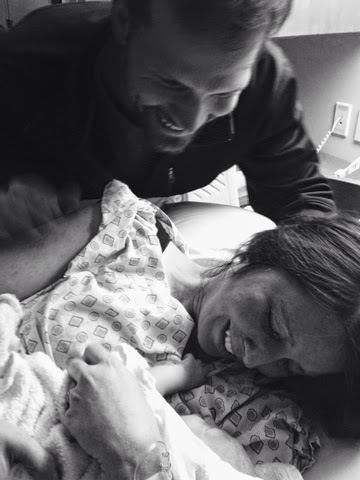 The room erupted in cheers as she handed me our sweet baby Kate. She was born at 7:50pm, at 38 weeks and 4 days, weighing 7lb 1 oz, 20 inches long. I can't say this enough, but God definitely had a hand in November 17. The fact that I was called off work, a labor that started and ended naturally, the nurses who just happened to be there when we got to the hospital, the c-section that excused the OB and graced us with a midwife, the delivery without any tears/lacerations, and that she was here before Molly's bedtime, so sisters could meet within minutes of her birth. It was perfect. The first thought I had when I heard her: "I have to do this again". It didn't feel like a medical procedure. It felt like a life event, the birth of a child. I was surrounded by the most encouraging people, and I truly can't thank them enough. I'm forever grateful for that room of women, my husband, and God's grace. It could not have been more beautiful.